Guess who is on the cover of Rolling Stone magazine this week? It is not a rock star, or an actor. It is not a politician. It is not a Hollywood celebrity. This week, Pope Francis is on the cover of Rolling Stone. Now he must be getting used to this kind of publicity, because recently the magazine The Advocate, a magazine for gay and lesbian people, named him person of the year! What is it about this Pope? He becomes the head of the largest Christian organization in the world, and what does he do? He starts questioning some of their deepest commitments. “Why are we putting so much emphasis on abortion and homosexuality,” he asked. “There are people out there who have immense needs! Let’s focus on that.” When asked about gays, he replies, “Who am I to judge?” And he just doesn’t say things. He does things. He goes to a prison, and washes the feet of prisoners. He jumps out of his pope-mobile to take a selfie with an admirer. He kisses a man whose face is horribly disfigured, so disfigured that this man’s own father will not visit him. But the pope not only embraces him, he kisses his face. He sneaks out at night, not to buy drugs, or gamble or visit a mistress, but to work anonymously at soup kitchens and homeless shelters. What is it about Pope Francis? He is a salty man. I think he not only understands, but he takes to heart the words of this mornings Gospel lesson. Now this text raises a few questions for those of who live in the 21st century. 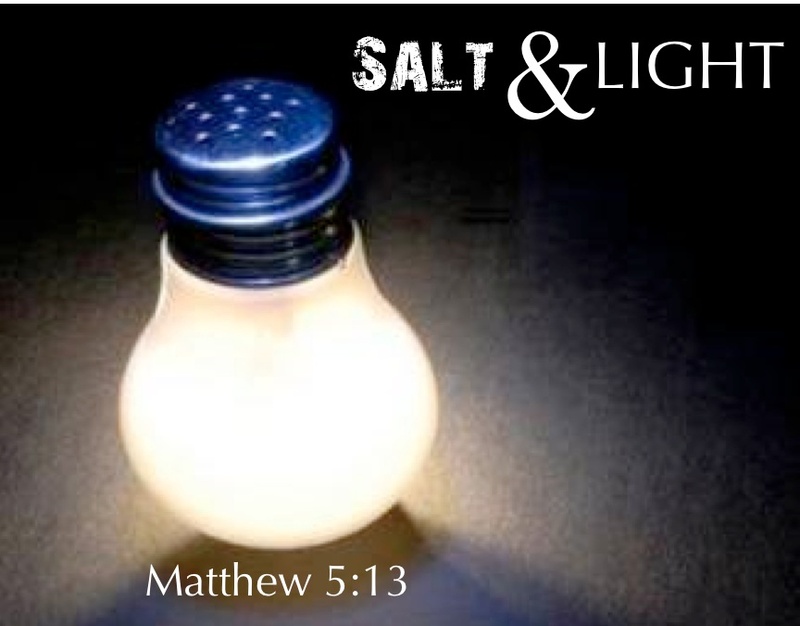 I can understand being the light of the world, but what is this about salt? Many of us are on a salt free diet. We don’t think of salt as a good thing, even though we might like it sprinkled on our eggs and popcorn. My doctor told me to eat less salt. I have to admit that I did not understand the significance of this until I saw the movie Gandhi. In the movie, and in real life for that matter, Gandhi initiated the Salt March. He walked 240 miles from his ashram in central India to the coast, and when it got to the coast he showed his defiance to the British by making salt. Why salt? Well, the British had a tax on salt, and they essentially controlled the production of salt in India. It was a way for them to maintain their hold on the people. The reason the British wanted to control the salt productions was that salt was one of the most essential resources in India. In a hot climate, you need to salt for two reasons. First, to preserve foods. Second, and more important, in a hot climate you tend to sweat and when you sweat, you lose salt. If you lose too much salt, you will be prone to headaches, groggy spells, lethargy and in extreme cases, even death. When I worked in a factory one summer, the managers would come by and give us salt tablets after the heat of the day, to replace the salt we had sweated out. In Jesus’ day, salt was an essential commodity for the people. Salt and light are essential to our well being. We need both to survive. Sometimes we are tempted to think of church as a nice thing we do once a week, or once a month. We think of the church as something we go to, and not something we are. We think of church the same way we think of other social clubs. But if Jesus is right here, the church is much more. It is something we ARE, not something we just attend. And it is a very, very important thing for the preservation of the world. That is a tall order, and one that makes me feel rather uncomfortable. And we are called to be a salty church. We are called to be salty people, to live salty. We are called to be light. In order to be salty, you have to engage with people. You have to get out of the salt shaker. I can put a salt shaker beside my eggs in the morning, but that is not going to do my eggs any good. The salt has to be on the food. We have to be out in the world. How are we the salt and light? One easy way is how we reach out to the neighborhood around us. We are a downtown church, and while that is not always easy, we embrace that. We are willing to put up with all the disadvantages of being a downtown church, so that we can be salt and light in this community. So we have the food bank. We give out bags of food to people who need it. Those things we are doing well. We are working in reaching out to children, although that is more of a struggle. But we have good people working on it. It is not enough to be salty with each other. We need to be salty out in the world. Let’s face it, the Church and Christianity has really bad PR right now. We are probably not as good as we like to think we are, but we are nowhere near as bad as many people outside the church think we are. We need to find create ways to engage the world. In his book Blue Like Jazz, Donald Miller talks about a booth he and some friends set up at a street fair at Reed College. Now Reed is probably one of the most secular schools in one of the secular cities in the country. The booth was a confessional. The sign on it invited people to come in for confession. 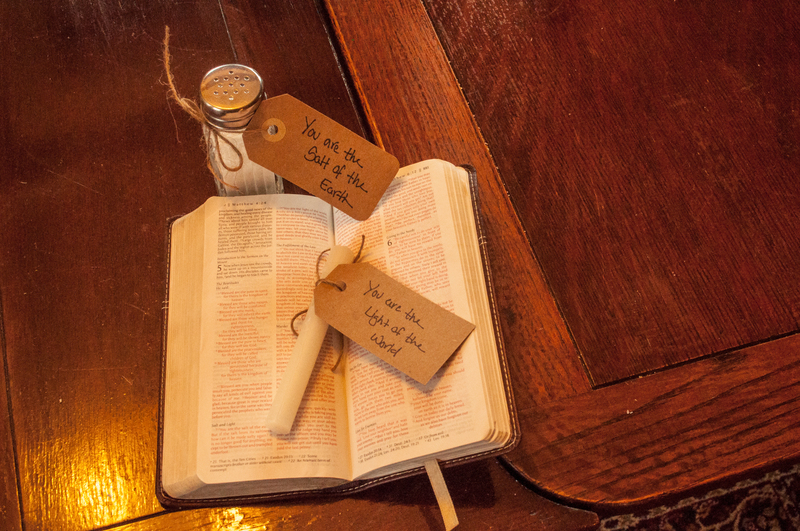 But when people entered, they found it was not for them to confess their sins. Instead they found Christians inside who were confessing and asking for forgiveness for the sins of the Church over the centuries. We are sorry for the inquisition. We are sorry for trying to take over the political process. We are sorry that our own sense of self-righteousness has hurt so many people. Now let me say this. When I say that we have be in the world, I do not mean that we go out, grab a picket sign, and start protesting. I do not mean that find contentious issues, figure out what side we are on, and advocate for that. It is not enough to just grab a sign, and go join into the thicket of people who are out on the front lines fighting about various issues. Being salty means you do it intelligently, in a way that people actually appreciate that you are there, and not just the people who agree with you. If we take sides on issue, then we are really no different from the world. Anyone can do that. That is not being salt. For example, what would it mean to be salty as the church looks at the current school strike? I don’t think it means that we go and stand with one side or the other. We might personally think that one side is more right than the other, but if we were to go out, as a church, as the salty people of God, and tried to bring light to the situation, picketing on one side or the other would make us no different from all the other people out there. And we would lose our saltiness. But we could, say offer something for all the parents whose kids have been out of school—an emergency “I know you have to go to work and don’t want to leave your kids alone at home all day,” kind of program. Our building is just a few blocks from ground central, the administrative offices. What if, in the midst of this conflict, we offered our building as a place of peace, a place where people could come and get away from the fighting? What if we went down to ground central and set up our own booth? “Meet and listen to your opponent!” You are welcome to come in here, but you have to sit and have coffee with someone you really disagree with. Maybe we set up a situation where people can listen to someone who disagrees with them, and learn to understand where they are coming from, so that they can resolve their differences. What if we figured out that after the strike there is going to a lot of hurt feelings and broken relationships, and the churches of Medford got together and threw a reconciliation dinner, where we invited people from both sides, and provided them opportunities to try to move past their hurts? That might be salty enough. I don’t if these are good ideas or not, but the point I am making is that we in order to be salty, we have to think salty. In order to be light, we have to be able to help people see things that they are not seeing now. Choosing sides and duking it out are easy, but we are called to be peacemakers. Being salty means we do what we do as Christians. How does salt lose its saltiness? Well, in reality it cannot. Pure salt cannot lose its saltiness. But back in the first century most people did not have pure salt. They got their salt from salt marshes, or the sea, or various other places. And often the salt was mixed with other elements. If you had a salt rock, and it got wet, the salt part of the rock would evaporate, but the other stuff would remain. And the other stuff is useless. So we can become unsalty. We can put our light under a bushel. We can lose or hide what it is that makes us distinctive as the church of Jesus Christ. If we are not careful, we could easily start looking like any other social club, any other political party, any other non-profit organization. I don’t have anything against social clubs, political parties or non-profits. But we are something different. We are a church. We are all about the Gospel of Jesus Christ. We are all about the Kingdom of God. So, you ask, what is the Gospel? There are many ways to say it, but for me it is the unconditional love that comes to us in Jesus Christ. It is bigger than just saying that Jesus died for our sins. That is but one action of a loving God. It is the entirety of God’s unconditional love. We embody the Gospel by loving God and loving our neighbor as we love ourselves. So being salty means that we approach the situation understanding that God loves the people on both sides of the issue. If we start fighting about whose side God is on, then we are no longer salty. The fact is God loves the people on both sides, even when we think one side is clearly in the wrong! And in the end, we judged as salt, not by how right we were, but by how well we love. Live in the light. Live salty! This entry was posted in Church, Jesus, ministry, Presbyterian, religion and politics, Sermon on the Mount, spirituality and tagged Christianity, Jesus, Light of the World, Salt of the Earth, Sermon on the Mount, spirituality. Bookmark the permalink.